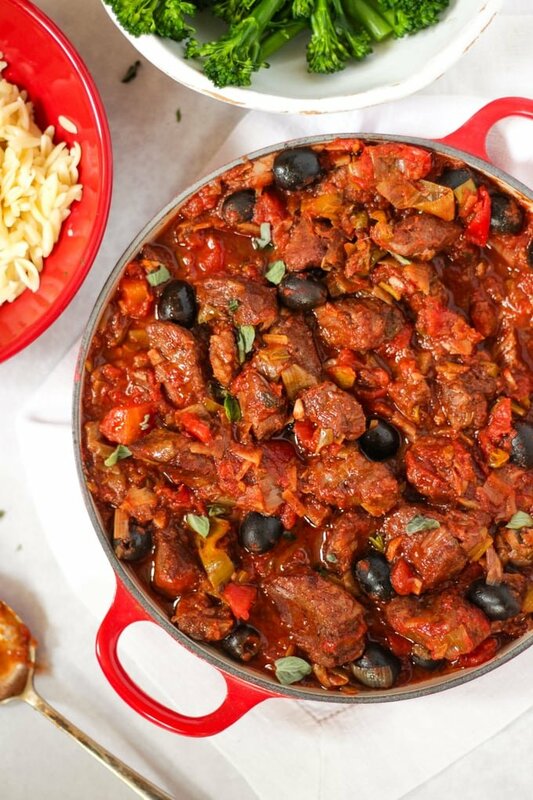 Perfect for the oven or slow cooker, this Pork Casserole recipe is cooked in a delicious Mediterranean style tomato sauce, for a healthy, comfort food dinner. This post was first published on 17th June 2014, fully updated including new photos on 18th April 2019. Did you see the note above? I first published this Pork Casserole recipe post in 2014. SAY WHAT. How have I possibly been wittering on here about food for that long?! Do you know what though, truth be told Gav (if you don’t get that reference we can’t be friends I’m afraid), I love it now more than ever. I’ve been chatting on Instagram Stories a bit recently about your food challenges, and how I can help. What content I can make that actually makes a difference to people and honestly? It feels SO good to be creating content that hopefully, people find genuinely useful and can make a little bit of a difference, just making your midweek meals a little bit easier I hope. ANYWAY, thanks for all of the reading over the years, I feel super inspired right now to create great stuff for you. So here’s to the next 5 years of us sharing all the (easy) yums! Hurrah! 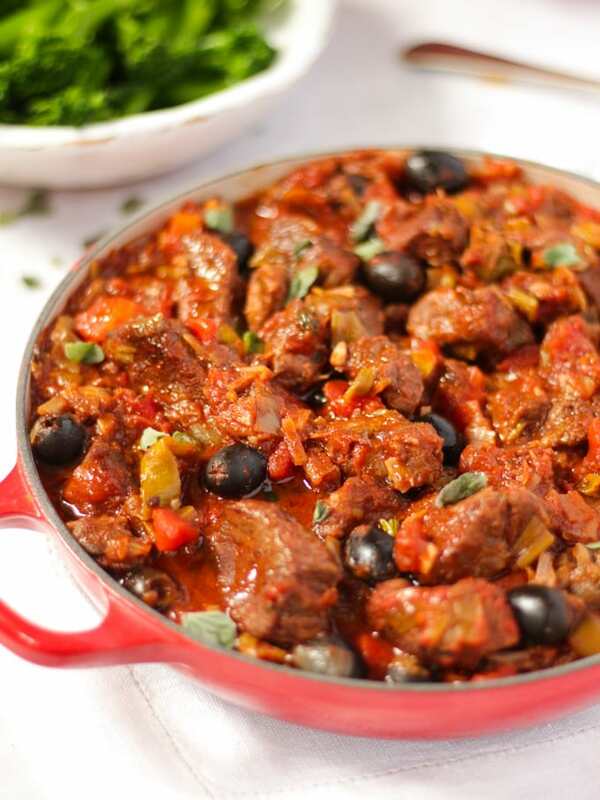 I can confirm, this Pork Casserole recipe is as simple and tasty as it was all those years ago. I’ve made a couple of tweaks here and there, but it has been a regular in this house for a long time. Here’s why I think you should try it.. It bubbles away quietly in the oven (or slow cooker) requiring zero attention. 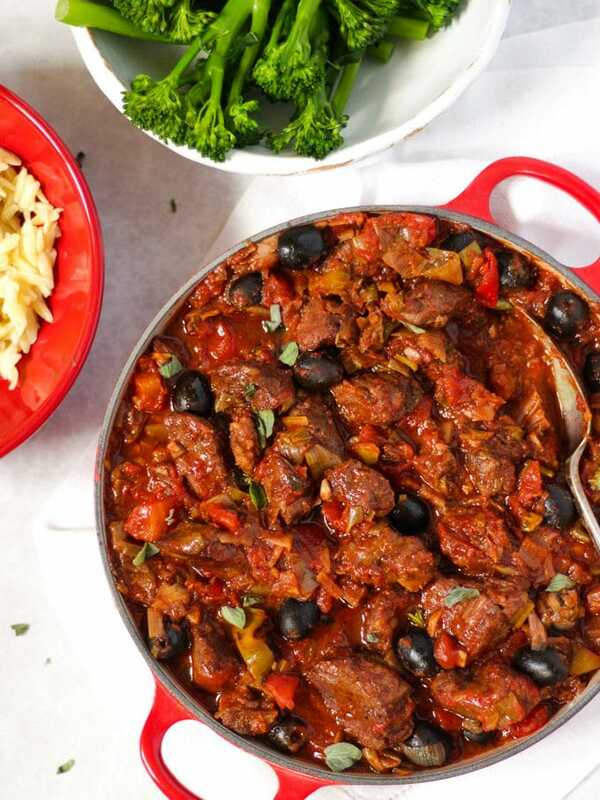 It freezes brilliantly, make a double batch and pull out a portion out of the freezer for a quick dinner when you need it. Pork shoulder is a really good value cut of meat, making it fairly economical for a meaty meal. How do you make Pork Casserole? Toss the meat in a bag or bowl with the cumin, ground coriander and cinnamon. Next, heat the oil in a pan (use oil spray if you’re following Slimming World, or trying to lower fat). 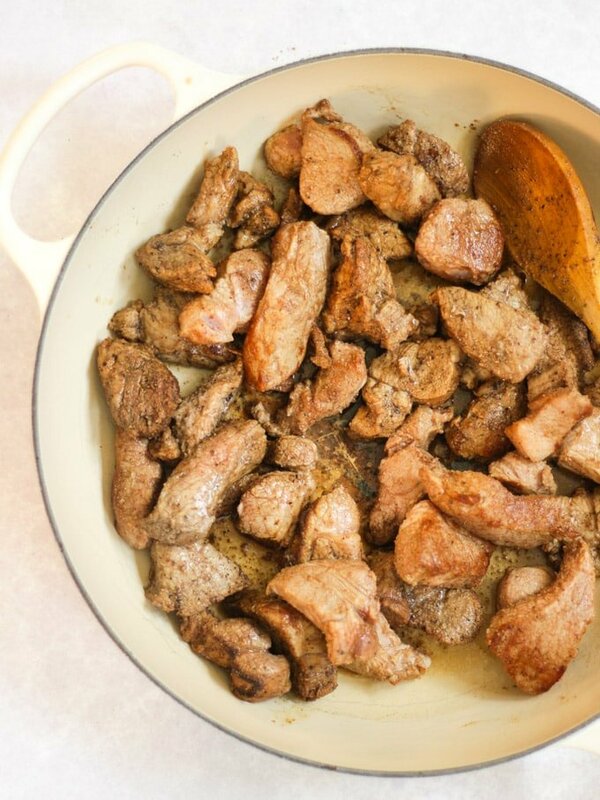 Brown the pork cubes in batches until browned and fragrant. 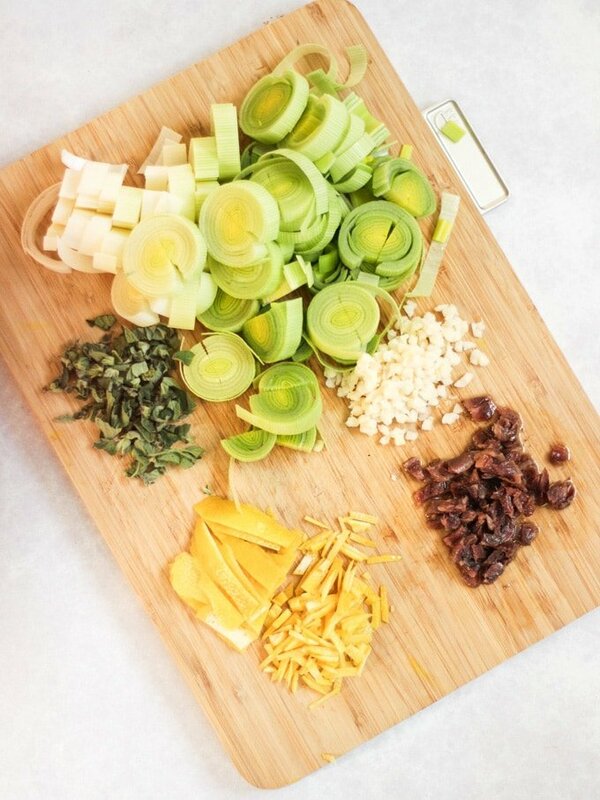 Next, chop up your leeks, oregano, lemon zest, garlic and anchovies. Even if you’re not an anchovy fan, please have faith, they add a deep, savoury-ness (is that a word?) to the sauce. You can’t taste them in the sauce (I HATE anchovies in their normal state) but it really makes this sauce special. For the lemon zest, peel the lemons and chop the peel finely (rather than using a zester). This is a little more robust than using a zester and adds another texture to the stew, a little bite. As always, frozen garlic is fine if you’re lazy like me! Add the garlic and leeks, soften for a few minutes. 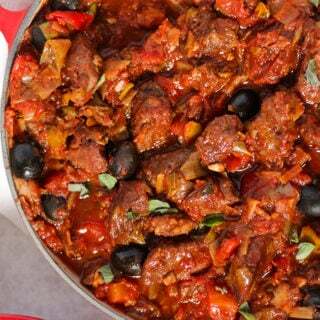 Then add the tinned tomatoes, wine, anchovies, lemon zest, olives, oregano and plenty of salt and black pepper. Give everything a good stir, pop the lid on and put into the oven for about 2 hours until the meat is meltingly soft. Can you freeze this pork recipe? I then defrost and warm through when needed. The sauce will thicken even more on reheating, just add a splash of water if you would like more sauce. 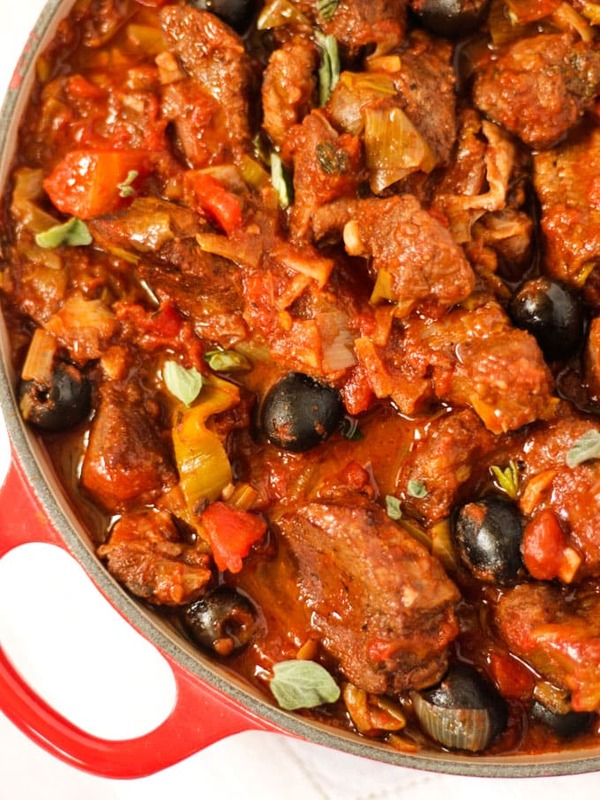 Can you cook this Pork Casserole in the Slow Cooker? Yes! 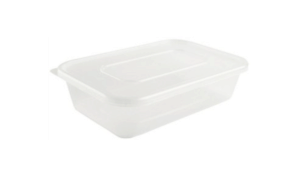 Follow exactly the same method, but reduce the tinned tomatoes to one tin only. Cook on HIGH for about 4-5 hours or LOW for at least 6 hours. A good quality peeler is such an invaluable piece of kitchen kit! A swivel blade has not only made my potato peeling so much more joyful (I know I need to get a life) but is also perfect for peeling lemons for this recipe. My most favourite knife in the whole world to make light work of chopping the meat. The much loved and used ALL the time cast iron pan. 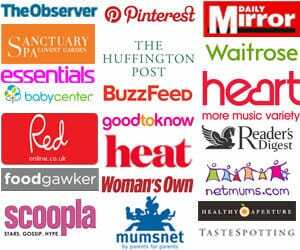 Fancy some more slow cooked dinner recipes? Hope you enjoy this recipe as much as we do. 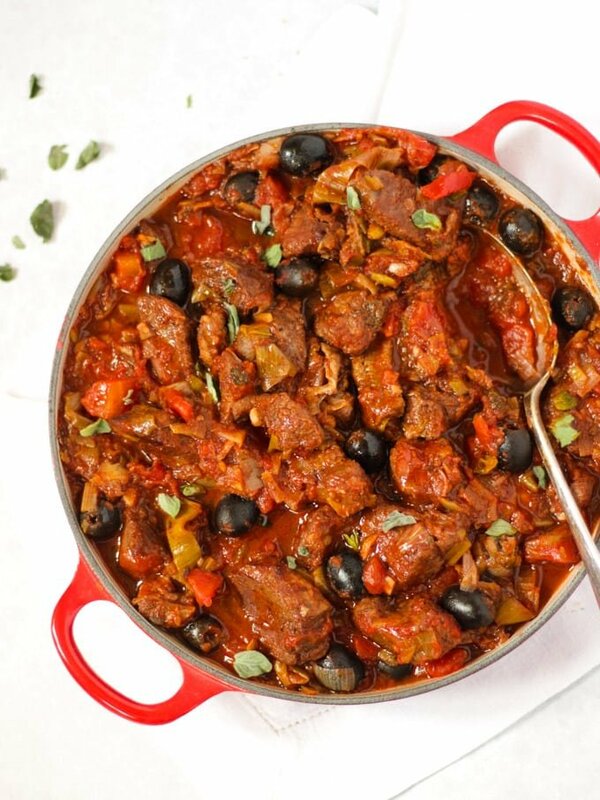 I’d love to know how you got on and what you thought of it if you make this Pork Casserole recipe. Please rate the recipe and leave me a comment below if you do. 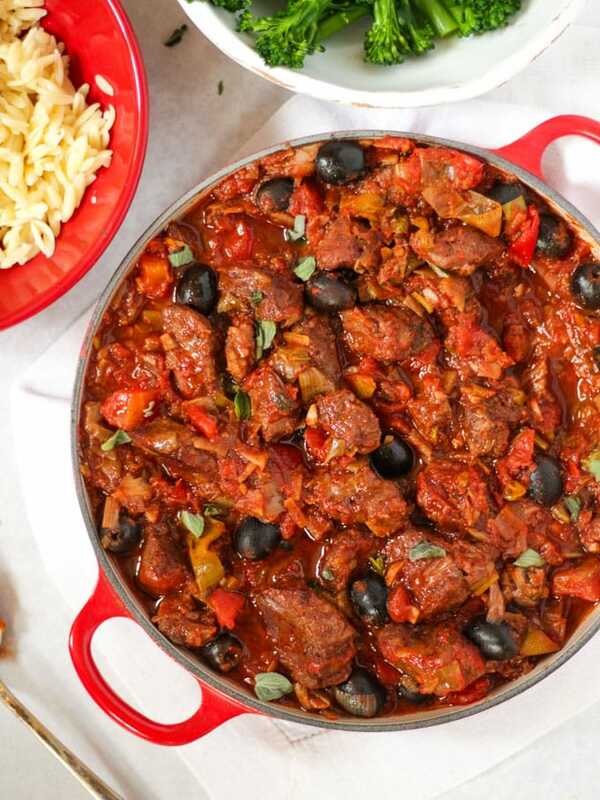 Perfect for the oven or slow cooker, this Pork Casserole recipe is cooked in a Mediterranean style tomato sauce, for a healthy, comfort food dinner. 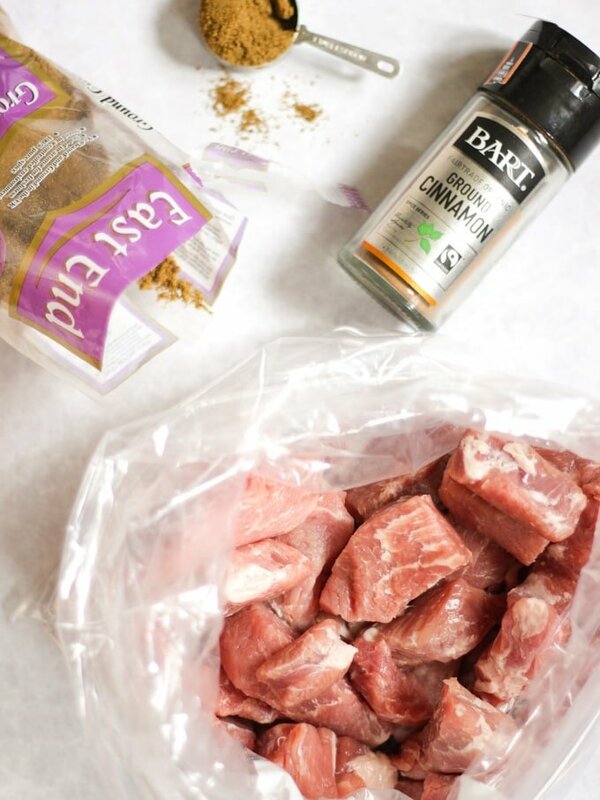 Put your pork cubes into a big freezer bag or bowl, with the cumin, coriander and cinnamon and toss well until they are evenly covered. Heat a little oil in a oven-proof pan and brown the pork in batches. Don't over crowd the pan. 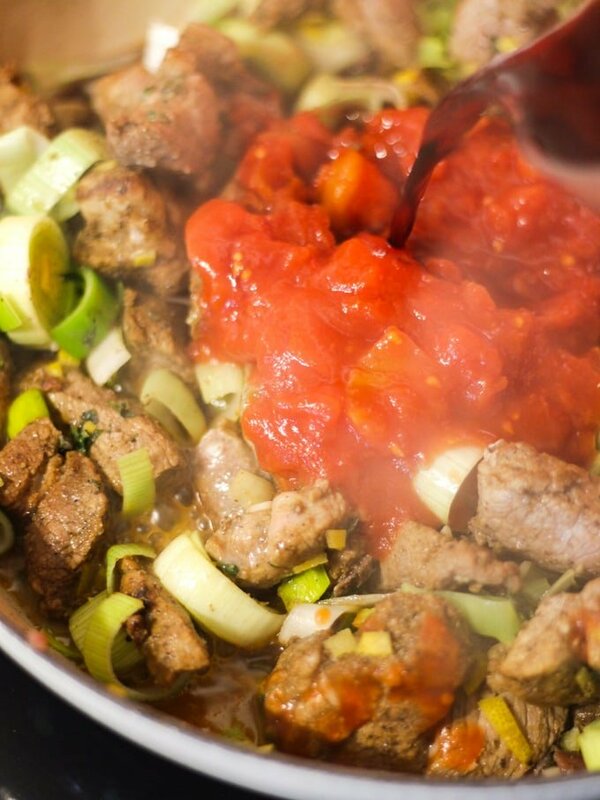 Add the garlic and leeks for a couple of minutes, add the pork back in, the tomatoes, wine, anchovies, the oregano and salt and pepper. Put the lid on the pan and pop in the oven for about 2 hours. Stir occasionally, you want the pork to be meltingly soft and tender, and the sauce to be thick but not dry. If the sauce is drying out at any point, add a dash of water. Serve topped with more fresh oregano if you fancy.